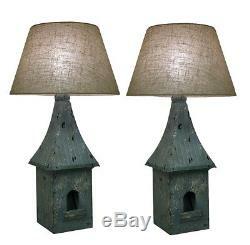 This set of 2 blue vintage birdhouse inspired table lamps with linen look fabric shade measures 32 in. It is creatively crafted of wood with a classic antique look inspired by decorative birdhouse designs. It has a blue finish painted with generous flecks of black and white that gives them a weather worn vintage vibe. Shed some light on your living room, dining room, or bedroom décor. These lamps are UL approved and both use 1 type A bulb (not included) each. The linen look fabric shade (included) measures 10.5 in. 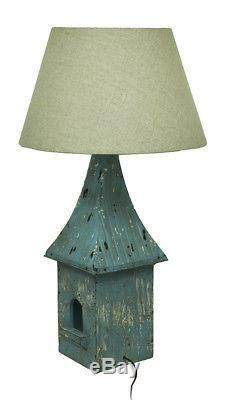 Set of 2 Blue Vintage Birdhouse Table Lamps Linen Fabric Shade. Creatively Crafted of Wood with a Classic Antique Look Inspired by Decorative Birdhouse Designs. Blue Finish Painted with Generous Flecks of Black and White to Gives Them a Weather Worn Vintage Vibe. Shed Some Light On Your Living Room, Dining Room or Bedroom Decor with 1 Type A Bulb (not included) Each. Diameter Linen Look Fabric Shade Included. NOTE: DUE TO MISSING ONE OF THE HARPS. (DAMAGE MAY VARY PER PRODUCT AVAILABLE), and/or other minor defects. Special notes for our International customers. We do not mark merchandise values below value or mark items as gifts, US and International government regulations prohibit such behavior. 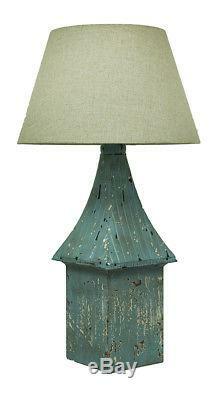 The item "Scratch & Dent Set of 2 Blue Vintage Birdhouse Table Lamps Linen Fabric Shade" is in sale since Thursday, May 10, 2018. This item is in the category "Home & Garden\Lamps, Lighting & Ceiling Fans\Lamps". The seller is "zeck0s" and is located in Winter Springs, Florida. This item can be shipped to North, South, or Latin America, all countries in Europe, all countries in continental Asia, Australia, New Zealand.